Travelling in a convoy of 94 London taxis with French police outriders on motorbikes was an unforgettable experience. Taxi Charity for Military Veterans planned and paid for the whole thing. The veterans were all in their nineties and they were all involves in D Day and its aftermath. I was a carer for Johnny Johnston, who has lived in Amble for more than 30 years. A train journey to London led us to our first night in the Union Jack Club in Waterloo. On the morning of June 4, we were picked up by Derrick Dane, our wonderful taxi driver, to travel to Portsmouth. Our ferry took us to Ouistreham, the port for Caen. A wreath laying ceremony near the beach was very moving. Arriving at Caen rather late, we eventually ended up in the Ibis Hotel. Not much sleep and a porridge free breakfast, (a sore trial for both of us!) we went on to the Pegasus Bridger area in convoy. The welcome we received was heart-warming, people of all ages were waving hands and flags, smiling and greeting us. The Johnston Fan Club appeared for the first time, just as it did everywhere we went. Johnny was asked to autograph books, pictures, posters and cards. 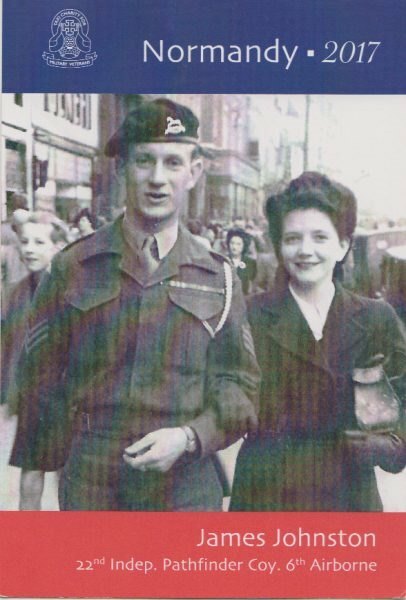 The cards showed a lovely black and white photo of Vera and Johnny at the time of their wedding in post war Britain (see image). Each veteran was given a pack of 100 postcard sized pictures to present to interested parties. Johnny gave away all of his cards to enthusiastic people of all ages who came to meet him. I didn’t expect that my school French, from 65 years ago would be so useful. The next few days flew past. We visited Ranville war cemetery for a service for paras who lost their lives. Johnny landed at Ranville early on D Day. A very good police brass band gave us music, as did an impressive pipe band. Johnny was a boy piper at the age of 14, later becoming a pipe major. We then went on to Bayeux, to a convent with large grounds, yet another meal and pleasant music. Next day we went to Merville Battery, a German artillery site which needed to be silenced on D Day. Lovely food was served in a marquee, with wine of course, served by local ladies, who made us feel at home. We were entertained by more music and lots of visitors came to talk to the veterans. During the Second World War small groups of parachute soldiers were formed into ‘pathfinder’ units, to parachute onto the selected drop zone ahead of the main force. Their tasks were to mark the drop zone, establish directional radio beacons to enable the coming transport aircraft to “home in” on the exact drop point and to clear and protect the area as the main force parachuted or air landed. The Pathfinder Company also acted as an early warning if the selected drop zone was heavily defended, possibly enabling diversion to an alternative. Once the main force was down the pathfinders were employed as a small reserve or reconnaissance force. The 22nd Independent Company the Parachute Regiment was formed between May and September 1943 to serve the 6th Airborne Division. On D-Day on June 6 1944 they jumped achieving limited success with the subsequent scattered main lift insertion. They fought around Breville and remained as line infantry in Normandy until the break out to the Seine in August. Johnny was a member of the 22nd Independent Company the Parachute Regiment. On our last full day we spent our time at an interesting Question and Answer session with a group of French school children and about 100 veterans. Natalie an accomplished interpreter did a great job, often translating quite long answers from the vets. Our final event was in Ouistreham, near Sword Beach. We mingled with locals and visitors in an atmosphere of camaraderie. All good things must come to an end, so it was back to the ferry, across to Portsmouth and a very interesting drive back to London, with all the lights and sights of our capital. Unlike Johnny, I have never done anything like this and I know that I’ll keep many pictures in my head. We saw sites, ceremonies and some of Normandy. The dignity and appearance of former paras, with all their medals brought a special atmosphere. The kindness and good humour of Derrick our taxi driver made everything so much easier. It was a visit to remember!